✦ Josko - Long time Ozorian, gatekeeper at The Dome, one part of Consorzio Occhirossi (with Mental on the other side) has been collecting and playing records for more than two decades. Throughout his career he has developed a distinctive sonic repertoire, drawing on a hypnotic, deep, and academic take on electronic music. He does not confine himself to trends and musical categories - his emphasis is on feeling and depth, and the emotional potential of sound. His sets create a unique sonic patchwork, creating an eclectic combination of sounds to deliver a hypnotizing groove that moves the dancefloor - both physically and emotionally. His tripped-out and futuristic take on Dance music is informed by its Detroit roots, as well as Dub, Psychedelia, and even sci-fi sounds - all part of the technologically-minded culture that he grew up in. Josko's approach to the DJ set, and the final result, are unique - he aims to go beyond the assemblage of different tracks to create a musical symbiosis - a sonic experience that goes beyond the sum of its parts, drawing on modern and early techno, contemporary and experimental downtempo beats, to snippets of speech and atmospheric soundtracks. ✦ Bodoo - co-curator of Ambyss, Marton Bodo aka. Marcial Arts aka. dj bodoo is a freelance graphic designer, photographer and dj/musician, living in Hungary, and travelling from there to all 6 directions. Radio host at Budapest' Radio Tilos 90.3FM *tilos.hu* and The Observation Radio Show at radiozora.fm, worldwide family member of Wonderwheel Rec. and Budabeats. ✦ Dj Qses (aka Dark Q) - Coming straight from Athens, Qses likes to travel within the sounds of Ambient, Downtempo and Progressive Trance. He will make his debut ambient set at Ozora this year! 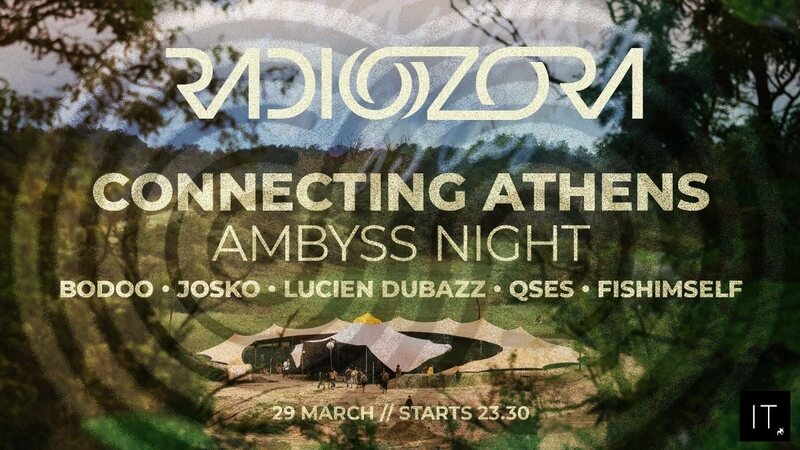 ✦ Lucien Dubazz - An other local power of Athens, founder of The Four Twenty Kolektiv, future Ambyss selector for 2020, he will make the night full & colorful. ✦ Fishimself - Our host and a true ambient ambassador and activist, owner of Freeze Magazine untill 2013 that printed edition stopped , Freeze was the one and only magazine supported electronic dance music from 1999. Athenian scene with the exclusivities and events. The night will be available to stream online at radiozora.fm, live, from the Chill channel.